We have just been connected to FTTC fibre broadband, giving us the opportunity to observe the adverse effects of crosstalk interference on speeds and Signal-to-Noise Ratio (SNR) margin at first hand. As the penetration of fibre broadband increases, so the likelihood of being adversely affected by crosstalk increases. Internet forums are awash with broadband users reporting declines in connection rates over time. Vectoring is a highly-effective solution to mitigate the adverse effects of crosstalk, and has already been widely deployed in Ireland. However, BT is still trialling vectoring technology and deployment plans are unclear. The longer it takes for vectoring to be deployed extensively across the UK, the more that fibre broadband speeds and performance will decline. Hurrah, FTTC broadband has arrived but what is happening to our maximum attainable speeds? Fibre to the Cabinet (FTTC) broadband has just arrived at our offices in rural Cambridgeshire thanks to the Connecting Cambridgeshire BDUK roll-out programme. We were actually the first to be connected to the fibre street cabinet, on port number number one! The photo, below, shows the Openreach engineer making the very first FTTC connection. Being located less than 200 metres from the street cabinet, we were hoping for maximum connection speeds (80 Mbps downstream and 20 Mbps upstream). Indeed, on the day of installation – with absolutely no other connections made to the street cabinet – our Billion 8800NL modem reported extremely impressive line statistics. Actual connection speeds were 80Mbps (downstream) and 20Mbps (upstream). Downlink Signal-to-Noise Ratio (SNR) margin was a very healthy 26 dB, with not a single error reported for hours. The downlink attainable speed (signifying what speed would be achieved if BT removed its 80 Mbps connection speed cap) was an amazing 145 Mbps! Sadly, our surprise over the connection statistics was relatively shortlived, as our line provided an excellent demonstration of the adverse effects of crosstalk interference with fibre broadband. As more fibre connections were made to the street cabinet, our line experienced a huge decline in both the maximum attainable speeds and the SNR margin in just three days, as shown in the table below. By the third day, downstream SNR margin had dropped from 26 dB to 8 dB, and the maximum attainable downstream speed had dropped from 145 Mbps to 87 Mbps. 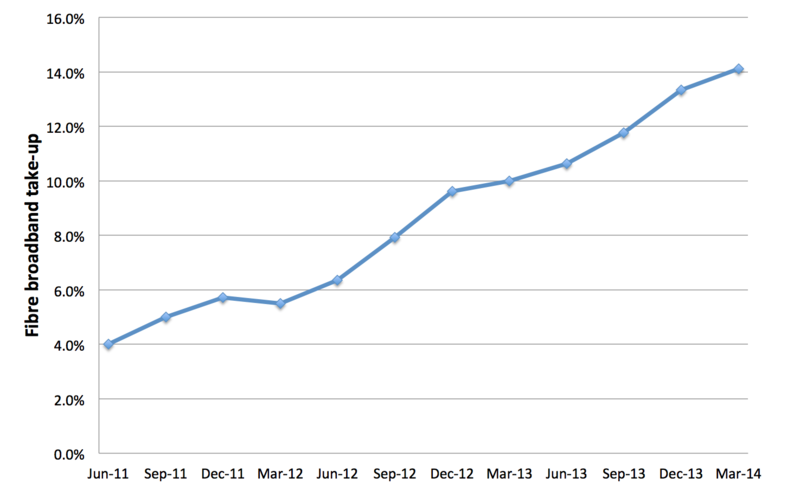 Over subsequent days, attainable speeds and SNR margin dropped even further. In less than a month, the attainable rate had dropped by more than 69 Mbps - due solely to crosstalk interference! Within a month, we were no longer connecting at the maximum speed despite being located within 200 metres of the street cabinet. We realise that we are one of the lucky ones, since speeds are still close to the maximum possible. However, many other broadband users have not been so lucky as they have started with much lower speeds to begin with. Internet forums are currently awash with broadband users reporting substantial declines in actual connection rates over time as fibre broadband take-up has increased. New! Since publishing this article, we have been deluged with emails with examples from people where broadband speeds have dropped substantially due to crosstalk interference, which BT itself has attributed to crosstalk. A neighbouring property has just had a second FTTC connection installed, and has suffered substantially from crosstalk interference too. The first FTTC connection (before the second was installed) was delivering a connection speed of 75 Mbps. When the second FTTC connection was installed, the download connection speed on the first connection dropped dramatically to 54 Mbps - an immediate decline of 21 Mbps. The connection speed on the second FTTC connection was 50 Mbps. A post in an Internet forum in 2011 asked, “Will FTTC result in a crosstalk crisis?” This article aims to answer this very question. What is crosstalk interference and why does it affect fibre broadband? While the term Fibre to the Cabinet has the word 'fibre' in it, this refers to the connection between the fibre street cabinet and the BT network (and the Internet). 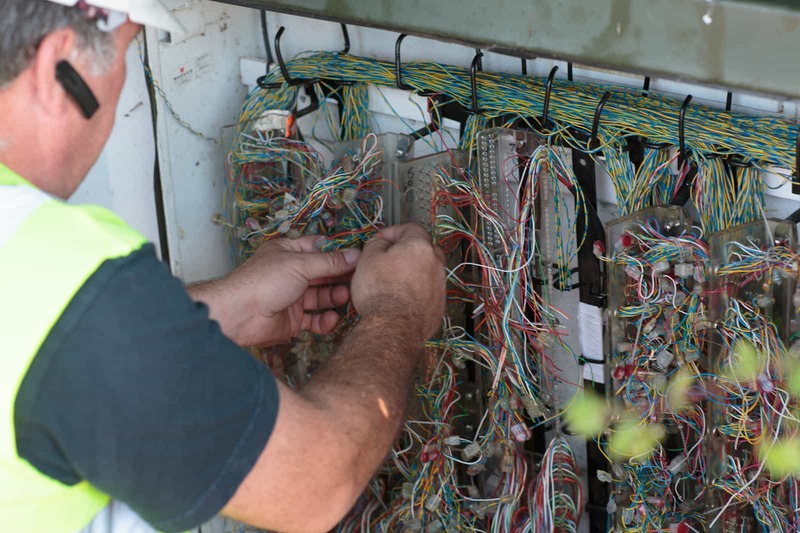 Just like conventional broadband, broadband signals still have to be carried along conventional copper (or, in some cases, aluminium) cables between the street cabinet and broadband users' premises. Conventional broadband uses ADSL or the newer ADSL2 and ADSL2+ technology. ADSL and ADSL2 uses a bandwidth of 1.1 MHz whereas ADSL2+ uses 2.2 MHz. In order to achieve higher broadband speeds than possible with conventional broadband, FTTC uses VDSL2, which uses a wider frequency bandwidth. BT currently uses VDSL2 with a profile known as 17a, which uses a 17.7 MHz bandwidth. Because of the higher frequencies used, broadband signals are susceptible to a particular type of interference – known as ‘crosstalk’ – from other VDSL2 broadband signals being carried along adjacent pairs. In engineering circles, crosstalk and the challenges it presents are well known. However, to date, BT and other ISPs have been relatively quiet about an issue that can results in significant declines in broadband speeds as the penetration of fibre broadband increases. What is particularly pernicious about crosstalk is the fact that it is essentially impossible to predict the extent to which a particular broadband user will suffer degraded performance. This is because the level of crosstalk interference depends on the position of the pairs carrying VDSL2 signals with respect to one another. One broadband user could experience significant degradation whereas another could be unaffected. This makes accurate predictions of broadband speeds impossible. The nature of crosstalk interference is well demonstrated by Table 1, shown previously. For example, between 10 am and 8 pm on the first day, the SNR margin dropped from 26 dB to 22 dB, signifying the presence of relatively minor crosstalk interference. However, on the following day, the SNR margin dropped more significantly, from 22 dB to 13 dB. This is a clear indication of the presence of a major nearby 'interferer', that is a neighbour's broadband connection that had just been switched on. While it is not possible to accurately predict the impact of crosstalk for any particular fibre broadband user, what is absolutely clear is that, as more and more customers are connected to a fibre broadband cabinet, the likelihood of crosstalk interference degrading performance will increase. To date, the UK has been 'protected' from crosstalk interference by the relatively slow take-up of fibre broadband (shown in Figure 1, below). Many street cabinets will currently serve relatively few cables carrying VDSL2 signals. However, as the penetration of fibre broadband services continues to grow, so the adverse impacts of crosstalk interference will become more widespread. Not only will the examples of broadband users complaining of declining speeds become more prevalent, but crosstalk will also threaten the achievement of superfast broadband targets by BDUK projects across the country. Many local authorities have set targets for the proportion of premises in their respective areas expected to receive ‘superfast’ download speeds (usually defined as above 24 Mbps). It is unclear what assumptions are being made about the presence of crosstalk (and its mitigation) by local authorities and Openreach. However, broadband users who may initially get download speeds in excess of 24 Mbps may find that speeds decline over time to below the 'superfast' boundary due to crosstalk. 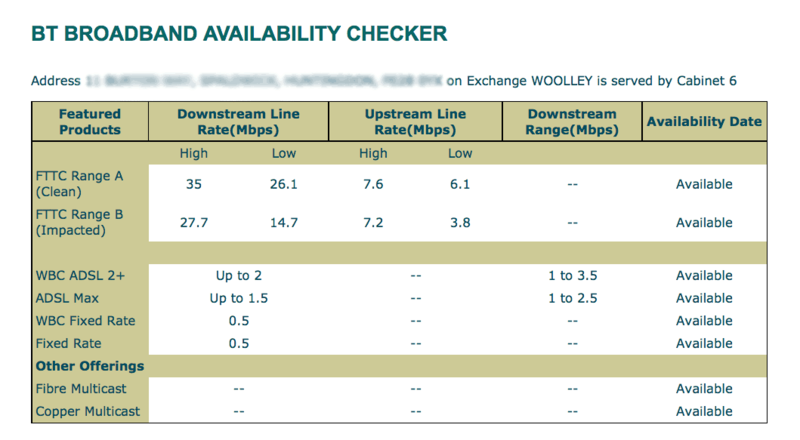 How bad could crosstalk get and is this reflected in BT's new BT Broadband Availability Checker? A user located about 200 metres from the street cabinet (i.e. relatively close) should easily be able to achieve the highest 80 Mbps connection rate in the absence of crosstalk. The measurements show that, with crosstalk, the download connection rate could fall to 70 Mbps or below, with a 99% "worst-case" download speed of about 54 Mbps. At a distance of 500 metres, ‘lucky’ fibre broadband users could be experiencing close to 80 Mbps connection speeds (in the absence of significant crosstalk interference) although many would experience download speeds between 57 Mbps and 75 Mbps with a 99% worst-case download speed of about 38 Mbps. The estimation of broadband speeds in the presence of crosstalk is problematic due to the substantial variability in speeds that can result. We believe that BT changed its Broadband Availability Checker towards the end of 2013 to better reflect degraded speeds that can result from crosstalk. Below is an example of the speed estimates now provided from the BT Broadband Availability Checker. As well as providing a range of estimated speeds for a "clean" line, the BT Broadband Availability Checker now also provides a range of estimated speeds for a so-called "impacted" line. An impacted line is essentially a line significantly impacted by crosstalk. The lower impacted line speed estimates are generally substantially lower than the clean line estimates, providing users with a huge variation in possible speeds. In the example above, the highest downlink speed estimate (35 Mbps) is well above the speed deemed to be 'superfast'. However, the lowest "impacted" speed estimate (14.7 Mbps) is well below what would be regarded as 'superfast'. The lowest impacted speed estimate is less than half (42%) of the highest clean speed estimate. BT has also not made clear the extent to which the lowest impacted speed estimates reflect a worst case scenario for crosstalk. Many broadband users may not realise that their initial connection speeds may not last for long. For example, a broadband user may initially be very satisfied when they first connect to fibre broadband and get broadband speeds close to the higher 'clean' estimates on the BT checker. However, they may be far less happy over time if their connection speeds fall towards the lower impacted speed estimates due to crosstalk. The BT Broadband Availability Checker certainly does not warn potential fibre customers that their speeds may fall over time due to crosstalk. We ran the BT Broadband Availability Checker for the 250 premises connected to our local fibre street cabinet, to gauge the differences in speed estimates. We found that the speed differences are absolutely astonishing. The average (mean) difference between the highest and lowest download speed estimates is 22 Mbps, although the fact that the maximum speed is limited to 80 Mbps actually disguises the true extent of the variability for many premises. On average, across all premises, and taking out those premises where the maximum speed is pegged at 80 Mbps, the lowest speed estimate is only 43% of the highest download speed estimate. Perhaps the most worrying aspect of crosstalk currently is the fact that most ISPs do not alert customers to its presence and potential impact over time. For example, despite the fact that BT provides "impacted" line speed estimates through its Broadband Availability Checker, BT's retail website provides its own speed estimates for customers considering signing up to its Infinity services, as shown in the example below. In this case, the "impacted" line speed estimates from the BT Availability Checker (falling lower than 70 Mbps on the downlink) are substantially lower than the estimated speed range for BT Infinity. The good news is that there is already is a highly effective solution to crosstalk, which BT could already be deploying in its fibre network. It is called ‘vectoring’. Vectoring involves advanced digital signal processing technology aimed at cancelling crosstalk interference to significantly improve performance and provide much more consistent speeds. This is achieved through the continuous monitoring of crosstalk coupling within a cable, and the real-time generation of 'anti-noise' that cancels out this crosstalk between all copper pairs. According to Broadbandtrends, the majority (57%) of telecom operators plan to deploy vectoring technology by the end of 2014. Broadbandtrends conducted a global service provider survey of telco operators regarding their plans to deploy VDSL2 vectoring, publishing their results in March 2014. In February 2014, Belgium’s telecom operator Belgacom and Alcatel Lucent announced the activation of the world’s first nationwide VDSL2 vectoring network. Eircom in Ireland has also been one of the first operators in the world to deploy vectoring technology. Eircom’s national deployment of vectoring, in partnership with fibre cabinet supplier Huawei, has been very rapid. In September 2013, Eircom announced that it would be one of the first European countries to implement vectoring on its network. It announced that vectoring would be deployed “early in 2014” across its entire Next Generation Access (NGA) fibre network and would be included with new cabinets added to the network. It claimed that, once the fibre network construction is complete in June 2015, about 700,000 premises would be able to achieve consistent speeds of 70 Mbps or more. On the 20th March 2014, Eircom announced that 150 of its 3,000 fibre street cabinet had been upgraded so far, with the “bulk” of the remainder to be completed by the end of the month. While some European operators are progressing rapidly with the deployment of vectoring technology, BT’s plans are unclear and it looks very unlikely that BT will copy Eircom by undertaking a nationwide rollout of vectoring technology during 2014. This is disappointing since many fibre broadband users will inevitably experience significant declines in speeds as fibre penetration rises as a result of crosstalk until vectoring is introduced. 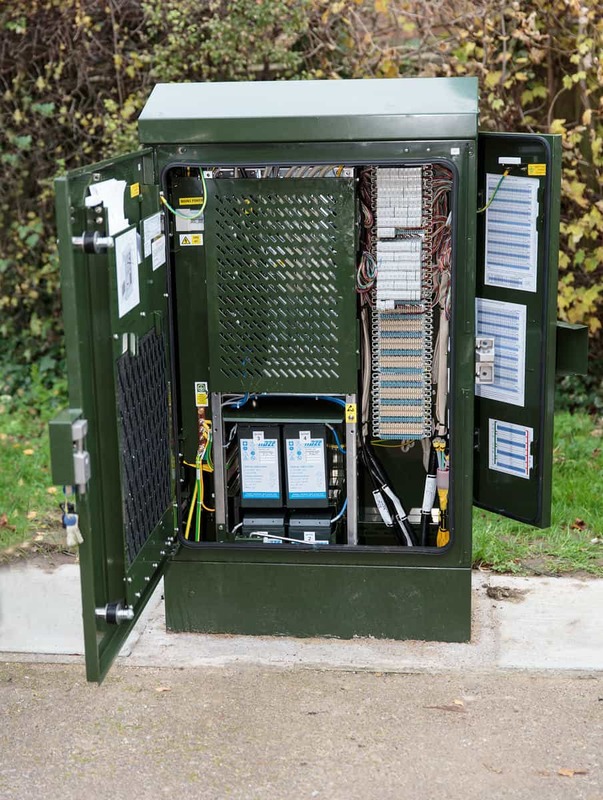 In September 2013, BT announced that trials of vectoring were live on one fibre cabinet, with the trials extended to five more cabinets in the following weeks, with completion of the trial in November 2013. Openreach selected cabinets 12, 39 and 74 in Braintree, Essex, and cabinets 26, 41 and 42 in Barnet as the trial sites. BT has very much seen vectoring as a ‘speed enabler’ (i.e. a technology that generally improves performance and makes speeds more consistent between users) rather than a ‘speed booster’ (i.e. something that will substantially increase top speeds). Reflecting this, BT did not change the maximum downlink connection speed from 80 Mbps for the trial and simply upgraded triallists to 80/20 services. Having said this, we expect that, when vectoring is launched, the maximum downlink connection rate will be increased to 100 Mbps. Feedback from customers involved in the trial has made its way onto Internet forums, and has generally been very positive. The number of users getting the full 80/20 connection speeds has increased significantly in the trial areas, with many fibre broadband experiencing speed improvements of over 10 Mbps. Its response stated that Openreach was committed to introduce vectoring technology into its network with an expectation that Openreach would begin roll-out of vectoring compatible DSLAMs in 2013, with initial plans in place to install vectoring technology in the network during 2014. BT stated that the “eventual” business case for widespread deployment would require “significant” investment. This all pointed to the commercial deployment of vectoring commencing in 2014, with a possible increase in the maximum downlink connection rate to 100 Mbps. So, it was rather surprising when BT Openreach announced in May 2014 that it would be extending vectoring trials with a second phase to take place during the summer of 2014. BT plans to trial an enhanced vectoring engine that has the capability of cancelling out more crosstalk interference than was possible in the first trial. News added (Jan 2015). We understand that BT intends to have 100 fibre broadband cabinets with vectoring enabled by the end of March 2015 in an expansion of its vectoring trial. Some observers now speculate that the UK will not see the deployment of vectoring until 2015 or even 2016. All we know is that the adverse performance impacts of crosstalk are tangible and will increase as the penetration of fibre broadband increases. The longer BT waits to deploy vectoring, the more fibre broadband speeds will deteriorate. Here's hoping that we see a national vectoring roll-out sooner rather than later. Don't forget to read our Increase Broadband Speed Guide to get the very best speed from your line. Also, did you realise that your WiFi could be the bottleneck in your home network? Our WiFi Optimisation Guide helps you avoid slowing down your connection.